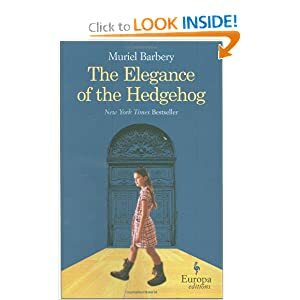 Summary: The Elegance of the Hedgehog is a wildly popular French novel in 2007 and was translated into English in 2008. The story takes place entirely in a well-to-do French apartment building in the center of Paris. Told fromthe point of view of two main characters we meet Renee, the building’s concierge. Renee is a widow and a lover of Art. She’s an avid reader, loves films, paintings, music and Japanese culture. But she takes great pains to keep her true self hidden from the rest of the world. To the residents of the apartment building, she’s the grumpy old lady who’s addicted to soap operas and her cat, Leo. Renee and her friend Manuela, a housekeeper, spend an hour every afternoon enjoying their tea and critiquing the apartment residents who are truly their inferiors in every way, except in material wealth. Paloma is a wildly intelligent 12 year old daughter of intelligent and accomplished parents who live in the same building where Renee works. Paloma, much like Renee, takes great pains to hide her intelligence and observations from everyone around her. Disappointed by everyone and her observations that life really has no purpose, she “rationally” decides that the only way to avoid the fate of all the adults in her life is to end her life on her 13th birthday. Until that day arrives, Paloma vows to diligently look for a reason to change her mind and wonders if Art holds the answer. Renee and Paloma’s lives do not intersect until a new resident moves into the building, a wealthy Japanese man named Ozu. Ozu is also an astute observer and suspects that both Paloma and Renee have much more to them than meets the eye. The Elegance of the Hedgehog takes quite a while to get going. I found myself getting bogged down in the author’s vocabulary and artistic mentions for which I had no frame of reference. I’m not sure if this is due to a lack of knowledge on my part, the author’s ego, or her method of explaining just how intelligent and cultured Renee and Paloma truly are. For me, it’s not until Ozu enters the picture does the story really take off and I found myself compelled to finish the book before I went to sleep. The ending caught me off guard and although I initially thought it was a cheap way to end the story, upon further reflection the way Barbery ended the book is fitting for her characters.